Alright, so you’ve managed to build yourself a pretty substantial email list. What now? How do you keep your current email subscribers engaged, while still having the time to be able to bring in new subscribers? The answer to that is to start using marketing automation in your email marketing. That means creating a set of templates and messages that are automatically sent to your subscriber once a certain action is triggered. These triggers can range anywhere from someone downloading a lead magnet from your website, to sending a personalized message on a subscriber’s birthday. According to Salesforce, triggered emails receive, on average, a 70.5% open rate and a 152% higher click-through rate when compared to your generic email broadcast. Even better, the study went on to find that businesses that use automated email campaigns average a 32% boost in sales and revenue in comparison to businesses that don’t. Essentially what email automation allows you to do is focus on your business while being safe in knowing that your business is constantly engaging existing prospects, bringing in new leads, and converting customers. But what kind of marketing automation campaigns should you be creating? Well, don’t worry because I’ve got you covered. I’m going to break down for you 10 Extremely Successful Email Automation Campaigns that you can immediately use for your own business! 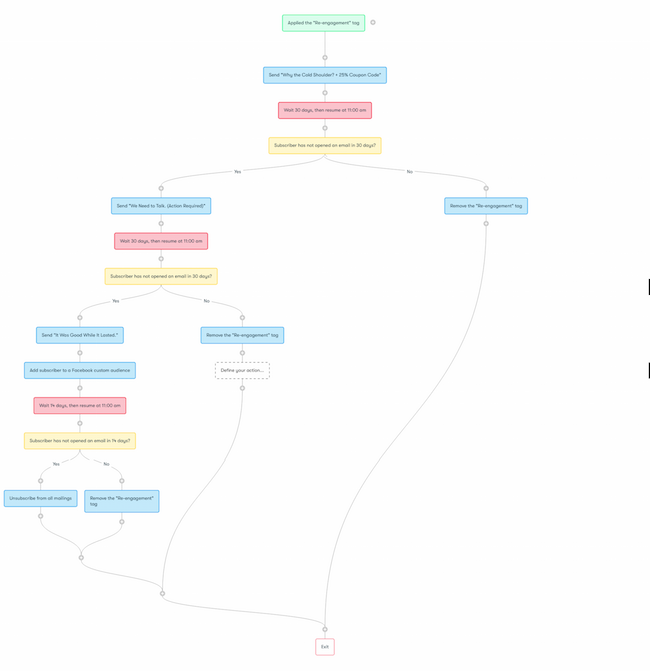 I’ll be illustrating these marketing automation email campaigns using Drip. However, you can easily create these in an marketing automation software like ActiveCampaign or ONTRAPORT as well. If you’ve ever been around the internet in the past ten years or so you will have undoubtedly encountered the classic “welcome email” at least once. In today’s marketing world it’s more strange if you don’t have a welcome email. A welcome email is, as the name suggests, an email that officially introduces who your brand is and what it’s all about to a new subscriber. And, when used strategically, it can be an extremely powerful way for you to automatically score new leads and help push a new prospect down further into your sales funnel. To see just how powerful a welcome email can be to your business all you need to do is look at the stats. First of all, welcome emails receive 4 times the open rate and 5 times the click-through rate than other marketing emails. On top of that, subscribers who receive a welcome email are 33% more likely to have a long-term engagement with your brand. The great news is that setting up an automated email campaign for your welcome email is dead easy. Virtually all email marketing software support this type of marketing automation so you shouldn’t have any trouble with creating this. That’s it. Anytime someone subscribes to your email list, regardless of how they ended up subscribing, they’ll automatically be sent your standard welcome email. However, your welcome campaign doesn’t have to end there. For example, Foundr uses their welcome email to gather more information about their subscribers by presenting three categories that new subscribers can sort themselves into. This way Foundr can ensure that their welcome series can be as personalized as possible to their new subscriber’s interest and therefore increase the overall engagement and loyalty. Another extremely effective email campaign you should consider implementing is the soap opera sequence. The soap opera sequence is basically a sequence of 5 emails, usually stretched out over a period of 5 days, with each email serving a specific function such as creating a sense of drama or suspense. All of it culminating in a final email that encourages a specific action from the subscriber. This is what a basic soap opera sequence looks like as described by Russell Brunson in his book DotCom Secrets. You can see how each email is created with a specific intent in mind and how the following email continuously builds upon the story of the previous email. 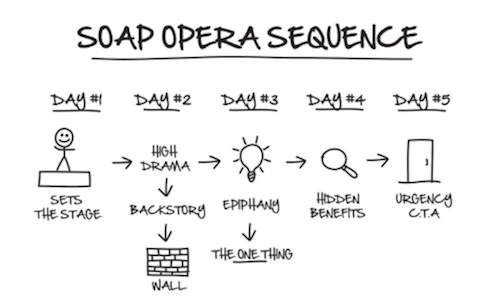 The soap opera sequence is typically used in the lead up to a product launch as a way to build anticipation. Here’s an example of how this basic sequence works for a product launch, make sure to note how each email addresses the concerns and objections of its audience. Another way to utilize the soap opera sequence is to combine it with your welcome email campaign. Instead of using it as a way to encourage prospects to make a purchase, you can instead use the soap opera sequence as a way to build that sense of know, like, and trust. Something that is very difficult to do over a single email. Once again, keep in mind that this is the soap opera sequence at its most basic form. You aren’t limited to 5 emails over 5 days. TinyLittleBusinesses has up to 14 emails for their product launch campaigns where other soap opera sequences get triggered depending on what action the subscriber takes. Take advantage of the most common scenarios for e-commerce businesses. The one where your prospect has loaded up their cart with a bunch of items but, for whatever reason, at the last minute they decide not to purchase. According to SaleCycle up to 68% of all online shopping carts end up being abandoned. BusinessInsider goes even further and estimates that online retailers are losing as much as $4 trillion a year due to cart abandonment. That’s a lot of money being lost there. This is where the abandoned cart sequence comes in. This email can either be a gentle reminder to the prospect about their forgotten purchase and therefore be a way for you to recapture that lost sale. Or you can use it as a way to gain some feedback from your audience as to why they didn’t end up purchasing. Create a more personalized email campaign when you consider factors such as how long that individual has been a part of your list, the number of purchases they’ve made in the past, or at what point in the purchasing process your customer left. Here’s an example of how Envelopes.com structures abandoned cart email sequence based on when a shopper abandons their cart. Just because someone has already made a purchase doesn’t mean that your relationship with them has ended, especially if you have other products or services you can offer them. This is when you can take advantage of a marketing tactic known as upselling, cross-selling, or downselling. While there are subtle differences between the three, the logic behind them is the same. The idea is that after a customer has purchased something, or in the midst of purchasing something, you subtly give them the opportunity to buy an additional product or service. Doing something as simple as recommending a similar product in your checkout email can increase your revenue by 10-30%. With eCommerce giant Amazon reporting, all the way back in 2006, that up to 35% of their revenue came from their upselling and cross-selling efforts. Here’s an excellent example of an upsell email by the Dollar Shave Club where they recommend other items to add to your order based upon your past purchase history. The easiest way to set up an automated upsell, cross-sell, or downsell campaign is to tag specific products within your inventory. That way you can make sure that your next offer is as relevant as possible to the initial order. As well as making sure that your upsell offers are sticking to the rule of 25. This is a general rule of thumb when it comes to upselling or cross-selling where you want to make sure that your recommended products don’t exceed more than 25% of the original order. Typically an upselling, cross-selling, or downselling campaign is triggered by the purchase of a specific item with the relevant product recommendation in the invoice email. Although don’t feel like you can only offer an upsell or cross-sell within the invoice email. You can just as easily create an upsell campaign triggered by anything from a milestone with a customer, to them attending a webinar. One thing that gets hammered about in virtually every single email marketing article is the importance of having a huge email list. But what is often forgotten is that a huge email list means nothing if the majority of your subscribers aren’t actively engaging with your messages. When it comes to email marketing you also have to consider stats like your open rate, and what percentage of your email subscribers are actually clicking on your links. Building your email list is only the first step, the next step is to make sure you’re running regular maintenance on your list. That means sending emails specifically designed to re-engage inactive subscribers, and removing those who are no longer engaging with your brand. As you can see from the following example by Udemy, typically a re-engagement email is sent when the subscriber has stopped engaging with the email for a period of time. An incentive, usually in the form of a discount, is offered within the email as well to motivate subscribers to continue interacting with the brand. The general rule of thumb is that you’ll want to remove subscribers who have been inactive between 6 to 9 months. However, depending on your own email list, that inactive period could be as short as a few weeks to a year. For example, Entrepreneur on Fire classifies inactive leads as those who haven’t opened or engaged with an email in any way for at least six months. Whereas ReEngager will begin their re-engagement campaign if subscribers haven’t opened an email in 60 days. However, you don’t have to limit yourself to a single email for your re-engagement campaign. After all, according to MarketingSherpa, only 24% of subscribers will read the initial re-engagement email. Which is why some brands will create an automated campaign of up to 4 emails in order to try to win back a subscriber. Here’s an example of the re-engagement campaign by TrueCitrus, make sure to take note of how each email builds upon the narrative created by the previous email. In the same way, you can automate your onboarding process for a customer, you can also just as easily create an automated onboarding process for any of your new hires and employees. This is an excellent way of making sure that new hires are educated about the company’s vision, history, and overall mission. You’ll even be able to add in quizzes within your campaign to test your employee’s knowledge, as well as create a touchpoint where you can check in with employees to see how they’re doing. This can be extremely helpful if your business relies on being able to process and onboard multiple new hires at once, especially if you have a P2P business model like Uber or Airtasker for example. Or, if you’re just looking to streamline your entire employee onboarding process and make sure that every new hire is subjected to the same type of training as everyone else. You can see how AskWonder, a professional research company, has automated their entire hiring and onboarding process with a sophisticated drip campaign designed to help them ensure that only the best candidates end up working for them. While there are a variety of ways to capture inbound leads, from creating lead magnets to creating an online tool for visitors to use, the problem is the process to qualify that lead. All B2B marketers and account managers will no doubt be able to recount at least a hundred different prospects they’ve tried and failed to contact. For whatever reason someone has opted into your email list you have a limited amount of time to follow up and connect with them before they lose interest in your business. According to Harvard Business Review, on average, companies take up to 42 to hours to respond to an online sales lead. This is shocking especially when you consider that prospects are 7 times more likely to become a qualified lead when contacted with an hour of expressing interest. Due to pesky things like fair labor laws and the human body’s need to sleep and eat, salespeople can’t be online every waking moment of their day to respond to sales leads. This is where an automated email campaign can come in handy. These days more and more salespeople are relying on automated email campaigns to help them prospect inbound leads. This way they can focus more on actually selling their product as opposed to spending all their time following up with unqualified and uninterested leads. This way anytime someone expresses interest in your business they’re automatically sent a followup email that makes it easy for them to set up a call or arrange a meeting with a salesperson. And if they don’t respond to the first email, then you can send some more emails over the course of a month gently reminding the prospect that you’re still available for a call. Here’s an example of the automated lead nurturing campaign used by account executives at LeadGenius, a B2B lead generation company. Notice how they use up to 4 different emails in their sequence over a period of 2 months. When Seth Godin was last on the Tim Ferriss podcast he revealed a fascinating statistic about online courses. He stated that most online courses have a 97% drop-off rate, with his own courses on Udemy and Skillshare having an 80% drop-off rate. Quite literally the majority of people doing online courses won’t end up completing it. That’s a lot of people who are missing out on a ton of value, and a lot of potential goodwill and engagement that you’re not receiving. The problem with most online courses is they have difficulty keeping their students engaged. In order to fix that many online course creators have taken to creating automated email campaigns specifically designed to encourage students to complete the course. Here’s an example of the email campaign by StickyAlbums for their online photography training course. You can see how they’ve created a campaign that accounts for all the potential actions a student can take. If the student hasn’t opened their next lesson, or has stalled in the middle, for a few days they would automatically be sent an email checking in with them and seeing what’s wrong. On the other hand, once someone has completed a milestone an email congratulating them on their achievement would automatically be sent. This ensures that their students are regularly being sent reminders to engage with the course, as well as giving StickyAlbums opportunities to speak with people who are stalling and understand why they’re no longer engaging with the course. Not only will this process help improve the completion rate for your online courses. But it’ll also give you a better understanding of how people are engaging with your material and how you can better improve it. One of the most critical stages in the customer journey is turning someone from a one-time customer to a repeat customer and then, hopefully, turning that customer into a brand ambassador. The simple reason behind why you want to encourage repeat business is that it is 10 times more expensive selling to a new customer when compared to an existing customer. Even a simple 5% increase in customer retention can increase your overall profitability by 75%. Simply put, repeat customers are the lifeblood of every business so you need a process in place that keeps your customers engaged and interested in your brand. In order to do that you have to treat your customers like royalty. Reward them if they make another purchase, regularly offer incentives to visit your store again, empower them to become an ambassador for your brand. Show your customers that you care. Check out this following example by TopShop where they offer their VIP customers early access to an exclusive sale. Not only does this incentivize customer to take part in the sale, but it also makes them feel valued and rewarded for their loyalty. In order to implement an evangelist sequence you first have to understand who your most dedicated customers are. This can easily be done through something like lead scoring or even creating a separate email list specifically for people interested in becoming VIP members. In the following example, you can see how the VIP members will receive a completely different set of emails compared to regular subscribers. Notice how the VIP members not only receive notification about the sale earlier, but they’re also given discount codes, and opportunities to refer friends and share on social to receive even more rewards. If you’ve been anywhere near the eCommerce space then you’ll be well aware of the power of wish lists. 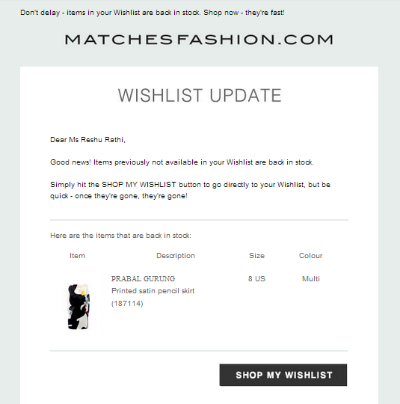 In case you’re not though, a wish list is a feature that allows shoppers to create a personalized list of items that they’re interested in but don’t have an immediate intent to purchase. This is a very simple way to improve the customer journey by giving them the ability to save certain products for future reference, but it also offers online retailers insightful information about their customer. A wish list gives a business an idea of what type of products a particular customer likes and what trends they’re following, giving you a better idea of how to market to them. It can also be a great way to help you understand what the supply and demand of a certain item is, as well as helping you minimize losses from out of stock items. When a customer creates a wish list they are actively giving their permission to be notified of this specific, and related, products. This is a process that you can easily automate. All you have to do is to create a workflow where anytime one of the above actions are triggered your customers are automatically sent an email notifying them of their wish list status. You can even introduce an element of scarcity to the wish list by automatically sending the customer an offer to remove an item from their wish list for them if they haven’t purchased it after a certain period of time. Marketing automation is quickly becoming essential for every company to adopt. And you can see why from these 10 examples of marketing automations that I presented. Try adopting at least a few of these into your own email marketing workflow, and you will definitely see more engagement and sales.